Today I was doing so well riding Wyatt that I envisioned myself calling his previous owners and telling them about our progress. He longes like a champ now. Under saddle he bends quite well and flexes at the poll. He's even cantering (you can't quite call it a "lope" yet) at a fairly respectable pace and holding his leads (most of the time). We'd succeeded in cantering nicely to the left and I was just about to end our schooling session by cantering to the right. And then my neighbor, who lives in one of the homes that borders the arena, let her pair of Labrador retrievers out to roam the hillside. Because the arena is set down in a sort of flood control plain, the dogs cavorting on the hill must've looked to Wyatt as if they were flying. I lost his attention completely. He tuned out my hand and leg aids, which is always a disconcerting feeling. He began to snort like a dragon with his tail raised above his back. Then he headed toward the gate at a big, lofty trot. Naturally, I tried to deter him, but it soon became abundantly clear that Wyatt did not steer as well as I had thought... at least not when flying dogs were pursuing him. Now, generally speaking, when I was younger-- and didn't have about $20,000 of computerized medical equipment implanted in my body-- I'd have stayed on and ridden through the distraction by circling, bending and/or galloping forward. But today discretion was the better part of valor. I gave Wyatt about 90 seconds to cool his jets. When it was evident he'd mentally checked out, I dismounted. Quickly. And then I introduced him to one of the most important tools of working with a young, green horse: The MRL (also known as the Mid-Ride Longe). In my opinion there is no shame in the MRL. It allows the horse to work through its anxiety or residual friskiness without me struggling to get him back into work mode. In about 5 minutes Wyatt had relaxed enough that I could climb back aboard and safely finish my ride. I've never been so determined to canter a horse around an arena on its right lead! Although the circles in the corners weren't quite as round as I'd like, there's always another day to polish them. Once Wyatt comprehended that he had to canter forward from my leg, give to my hand and circle when requested, and hold his right lead, I pulled him up, gave him a pat, and called it a day. Tomorrow we'll repeat the whole lesson once more, minus the flying dogs. And without an MRL. I hope. If you'd like to share a comment, just click on "comments" below. When I'm bored, I clean tack. Or I wander through the halls of ebay, window shopping for stuff that I have no need for. I've browsed at handpainted decorative gourds, vintage cowgirl this 'n that, and pretty much anything said to be beaded by a Native American artist. As a last resort, when I'm bored I do housework. But I have to be really, really bored for that! Fortunately, Wally is a simple creature. I've discovered that he will spend hours playing with his set of big orange CAUTION cones. He'll hold one of his big plastic cones in his teeth, flip it up and down, bob his head enthusiastically, and then toss it a few feet. Then he trots after it only to pick it up again for another round of Cone Tossing. He reminds me of my sister's Jack Russell terrier going after a chew toy. Unfortunately, the cones don't last long under these circumstances, which means I have to make regularly scheduled trips to my local hardware store. Pretty soon I'm going to be known as The Cone Lady. Wyatt, on the other hand, is unimpressed with Cone Tossing. He has some mild interest in his Jolly Ball, but he'd rather play a game of tag. Not with me, mind you, but with the horses that pass by on the trail that runs right below our property. I always know someone is riding by because Wyatt's white tail will flip up, he'll arch his neck and he'll trot the length of the paddock with a lofty gait that makes me think that if he had a dose of warmblood in him he might have had a career as a dressage horse. 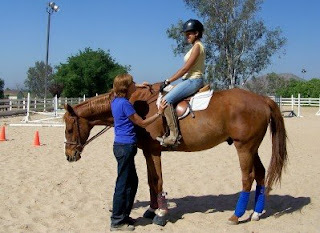 This is a photo of me (in my part-time role of riding instructor) with one of my students. Her name is Veronica, and her mom-- who's quickly being indoctrinated into the role of Horse Show Mom-- was kind enough to snap the picture. I really enjoy teaching Veronica. She has natural ability plus she's also quite determined. The result is that usually she pushes herself to succeed rather than me having to whine, plead and go into theatrics to get my point across. To be honest, I really didn't think I'd like giving riding lessons. My ex-coach and friend, Susan, asked me if I'd like to run her lesson program after I got injured in my infamous jumping accident. Since I could no longer compete, it seemed to Susan like a good idea. Everyone else thought it was a fine idea, too, except me. Mostly to keep my friends and family from thinking that I'd become withdrawn and depressed about my injuries, I dragged myself to the job, in a manner of speaking, kicking and screaming. I think that I had some real unresolved issues about being yanked from competition sooner than I'd planned. I'd wanted to relinquish my amateur status on my own terms. It had never occurred to me that I'd become, in the eyes of the United States Equestrian Federation, a "professional" before I had decided I was tired of chasing blue ribbons in the amateur adult hunter and equitation divisions. But fate-- and a certain Hanoverian mare-- made the decision for me. It's taken me about 2 years to really settle into the groove of being a riding instructor. While I cannot EVER envision myself doing it more than a few days a week, I actually like sharing what I've learned in about 40 years of riding huntseat. All of those clinics I rode in, all of the trainers who taught me, all of the fine and/or quirky horses I rode and all of my peers who challenged me to ride to my best capabilities served me well. Little, fundamental skills that I took for granted-- like how to adjust my horse's stride in a line of jumps to get first 4 strides, then 5 strides-- are grand moments of epiphany when explained to a novice rider. What's even better? I get to relive learning all the basics of good riding once again. There's a certain reward that comes with that. It's almost like reliving my youth. When I get a chance to share in the successes, struggles and failures of my students I'm taken back to a time when I also fought fatigue and discouragement to try, once again, to "get it all right." And that's pretty much why I've come to enjoy my job. Yesterday I went on a long trail ride with my friend Natalie. She rode one of her trusty grulla geldings and I was aboard Wally. We hauled out to the area surrounding Irvine Park which, to those of you unfamiliar with Orange County, California, is one of the few remaining undeveloped areas out here where riders can truly appreciate what early southern California looked like before it was paved over with asphalt and shopping malls. The 3-hour ride was wonderful and included all the elements that tested a true trail horse: water crossings, street crossings, bridges, hills (both up and down), and stepping over logs set in the trail to prevent erosion. Oh. And when we navigated through the park we had to negotiate our way past picnickers and hordes of little girls who were jumping up from their sandwiches and potato chips screaming, "Horses! Look at the horses!" Wally was a real trooper. My formerly disgruntled ex-western pleasure show horse has found his niche: Trail Horse Extraordinaire. But actually getting him to the trail ride... Not so much fun. You see, Natalie and I decided to carpool-- or "trailer pool"-- because gasoline is just about $4.00 a gallon out here. She has a slant load and Wally had only been hauled in a slant before I bought him (I have a straight load trailer), so I figured, what the heck: Wally could ride with her horse. Not so easy. Wally hopped right in and he was happy as a clam. But once we got to the trail head at the park, it became obvious that there wasn't quite enough room for him to step back a foot, pivot on his hind end, and turn around to walk out. Instead he'd have to back out, which required him to step off her trailer with his hind feet into nothingness. She doesn't have a ramp. That scared poor Walter. If you could see him backing down the ramp of my straight load, you'd understand: He backs out cautiously and slowly, with little itty bitty baby steps. The task of blindly backing out of Natalie's step up trailer was simply too challenging. Not ones to resort to extreme measures, Natalie and I took our time with Wally until he finally got up the courage to dangle one hind hoof out into space (all of about a 6-inch drop, by the way), and hop down. Then we rode. And then we cooled out our horses, gave them some snacks and plenty to drink and we re-loaded. Wally once again hopped right in and we were confident that the unloading lesson was learned. Yeah, right. When we got back to my house, Wally once again looked at us as if we were crazy. He simply wasn't budging. He'd start to put his hind hoof out, then immediately re-think that idea. And he couldn't turn enough to lead out head first. Finally Natalie said, "Cindy, I don't know what to do!" Apparently, the prospect of Wally living in her trailer didn't appeal to her. Then I got an idea. We had some sandbags lining the horse trail in front of our house to prevent run-off during the rains. I hoisted a few beneath the back of the trailer, making a pair of soft yet supportive "steps" for Wally. Natalie and I tried again. She gave Wally the command to "back" at his front end while I was at his hind end, reassuring him that I wasn't going to let him descend into oblivion. Finally, he stepped down with one brave hind hoof, felt the sand bag, and then came out. By not panicking and resorting to yanking and whacking on Wally, we got him out of the trailer. And the moral of this story? Don't assume that your horse fits in a trailer just because he can get in the trailer. It needs to be roomy enough that he can also comfortably get out of the trailer. Needless to say, next trip I'm hauling Wally in my straight load trailer. And now I'm off to ride Wyatt in the arena before Easter dinner. My sister, Jill, is coming to watch. She has yet to see Wyatt, and her first introduction will be watching me attempt to canter him around the entire arena. He trotted a lot of nice circles on Friday. And he longed great! So we'll see how this goes. Stay tuned! Here is a quick snapshot of my new horse. I had just finished bathing him when I figured this was my best chance to take a photograph. He's buckskin and white with a black mane and a black and white tail. He's actually a lot lighter, especially on his haunches, when he's dry. Of course, right after this was taken I put him in the turnout paddock and he promptly rolled. You can imagine what he looked like after that! His name is Wyatt, which I think fits him as he's very much a western-type riding horse and his name makes me think of Wyatt Earp, the western gunslinger hero. And now I have Wyatt and Wally! Wyatt is only 3, so he has a lot to learn. But I like his basic temperament and he has been well started. He's certainly not ready to be ridden along the streets and trails in my neighborhood, but I think very soon I can haul him out to a park for a ride in the Great Outdoors. First, however, I want to spend some time working with him on the ground and in the arena. Step One is teaching him how to longe and be bitted up in side reins to help him become more supple. Problem? He's been worked in a round pen, which is nice, because he grasps the concept of moving around me in a circle. But he has never been officially taught to longe. And I'm trying to longe him in my turnout paddock, which is very much a large rectangle. So we do fine 3/4's of the way around the circle, when the fencing forces Wyatt to turn. But when he doesn't have the fence to guide-- or contain-- him, he tries to retreat to the far end. Believe me, Wyatt is about the 87th young horse I've taught to longe, so absolutely nothing he can pull is new to me. He will learn to longe. I am the Borg Queen. He will be assimilated. In fact, by the end of our first session today Wyatt was walking, trotting and halting quite nicely ON A CIRCLE. The canter? Not so much. But give me a week. I bought a horse today. I know. It happened kind of fast. And I blame it all on my sister, Jill. See, she emailed me a bunch of online horse ads (like from Dreamhorse, Horsetopia, equine.com, etc.) complete with her acerbic comments on each horse's conformation, price and training level or lack thereof. 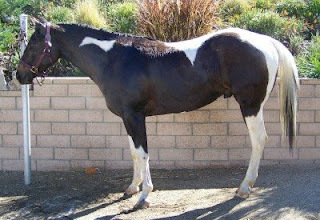 One of her favorites was a 3-year-old buckskin and white tobiano paint gelding. At first I ignored Jill's email, because I'd investigated that same horse previously and his online photo was... not impressive. Well, now there was a different photo posted with his ad and he looked quite cute. So I called. Turns out the horse was still owned by the people who'd bred him. His dam was still on site. He'd originally been kept as the husband's personal horse (he's a recently retired firefighter) but he really decided that horseback riding was not his cup o' tea and the gelding had not been getting much use lately. With hay prices skyrocketing, it was hard to justify keeping the horse, especially when they had other foals on the ground that needed to be raised and trained. So once again: ROAD TRIP! This time, though, Ron only had to drive me about 90 minutes to the high desert. It was a pretty drive. There was a light dusting of snow still on the ground from last night's storm, and it was brisk and breezy. But the Joshua trees (these unusual, dramatic-looking cactus) looked stunning against a backdrop of snowcapped mountains. I'll spare you a detailed recounting. But in a nutshell, as soon as I saw the young paint in the roundpen, how he moved, how he stood patiently to be groomed and tacked up, I knew I wanted him. I asked to ride him in a simple loose-ring snaffle and a pair of split reins, so I could figure out just how much he knew and how much he didn't yet know. He was very green, but understood the basics of moving away from leg pressure and maintaining a pace. I really liked that he willingly went forward, even though he was a bit on the lazy side (I consider laziness a bonus in a 3-year-0ld). Plus he was very smooth to ride. After a 20-minute ride in the round pen I took him on a trail ride across the desert. I rode with the seller's niece, who was aboard a feisty older mare. The gelding, on the other hand, cruised along on a loose rein. He didn't seem to mind whether we stayed on the marked trail (a gravelly dirt road that seemed to go to nowhere) or wandered through the creosote bushes and sage brush. When we returned to the barn I asked to see him load into the horse trailer. He hopped in like a champ. Since I had rushed out there to beat another buyer who was coming for a second look, I decided I had to make a decision. But it was an easy one. The sellers seemed to think I was the better home, too, which made me feel good. "You make him look so good when you ride him," the seller's husband said. "You bring out the best in him." So I gave them a deposit and I'm picking him up tomorrow. Though my recent trail rides have been quite memorable, I think that my favorite memories involve the many years I spent competing on the show circuit. They're all so vivid that it seems like yesterday, though I haven't dressed myself in show attire since my riding accident, and that was almost 3 years ago. Yet when something gets me to thinking about a particular show ring incident-- whether it's glimpsing a faded photograph or chatting with an old horse show buddy-- I almost feel transported back to that time and place. The first big show I ever rode in was held during the Orange County Fair. I boarded my own little horse at the fairgrounds, which was located just inland from the beach here in Southern California. Though it was July, the cool ocean breezes made for perfect horse show weather and I decided that I couldn't miss an opportunity to join in with the festivities. But I couldn't possibly ride Honeybee, my scruffy, barely civilized sorrel mare. 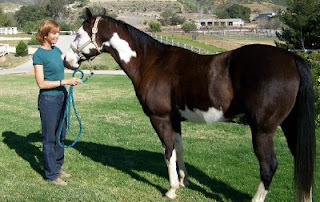 Instead I set my sights on showing Smoky, a coal black gelding who, rumor was, had been professionally trained as a western pleasure and trail class horse. Though he was definitely out of shape and out of practice (I remember his bony, angular frame and his unruly mane), I brokered an agreement with his owner: I'd muck his stall and work him regularly in exchange for being allowed to show him in the 14 & Under Trail class. Being an industrious 13-year-old, I spent hours with Smoky. I shampooed and curried him until his ebony coat glowed with a midnight blue sheen. I finally got the dreadlocks out of his tail. And I could almost get him to step directly from the walk into the lope, something I figured would be required for the rail work portion of the class. As the county fair got underway and the horse show approached, I became so excited about my debut! I settled on what to wear: my black Wrangler jeans, a checkered red blouse and a bolo tie. I scrounged around and borrowed assorted western show tack from the other boarders. In retrospect, nothing Smoky and I wore matched. But that really didn't matter because, as you can imagine, I knew next to nothing about showing in a trail class. All I knew was that I wanted to be a part of the atmosphere of a nationally rated horse show. When the show day came, I warmed up in the schooling area with all the other riders. Some part of me recognized that Smoky and I looked like foreigners among the sleek, royally bred Quarter horses, Paints and Appaloosas that seemed to glide along at the jog and lope. Their riders were so sophisticated, so poised. And then there was me: flogging Smoky with the end of my romal reins with one hand to get him into the lope, and holding onto the brim of my straw hat (that I'd spray painted white, by the way) with the other hand. When the class was called to order I rode Smoky through the in-gate with the rest of the competitors. I don't remember much about the rail work or the trail obstacles, but I do clearly recall gazing up into the grandstands and being enthralled by how many people were sitting there, watching me. I was on stage, and my performance was taking place on the back of a horse. How cool was that? I'm sure that's when I was officially hooked on horse shows. The fact that I got fifth out of five riders didn't dim my enthusiasm. I clutched that huge pink ribbon and trotted Smoky back to the barn, and breathlessly recounted the entire experience to anyone who'd listen. Though I've certainly won more prestigous ribbons during my life with horses, that inconsequential piece of pink satin changed my world. I hope you have something to share. Some of your comments may end up in a future issue of Horse Illustrated magazine! Really, I'm not enjoying this whole horse hunting thing. "In the latest installment of Cindy Goes Horse Shopping, we follow our heroine as she coerces her husband into driving her 100 miles north of Los Angeles to a small town that barely registers on Mapquest." Last night my husband and I could hardly sleep. Ron was concerned about getting on the notorious Southern California freeway system before dawn in order to avoid the usual bumper-to-bumper melee. I was simply too excited to sleep. I was so sure that several glorious trail riding prospects awaited me several hours away! We drove through the pre-dawn darkness, hauling an empty trailer, certain that it'd return with cargo. I cradled an envelope of cash that represented my entire horse buying budget. I really felt that I'd researched the horses I was going to see: the photos were nice, the seller provided all kinds of details and, as an added bonus, they were a bit negotiable on the prices due to the lackluster market. After almost 3 hours on the road, we arrived. Right away I knew I was going to be disappointed. I saw the two mares at the top of my list standing in a large dirt paddock and thought, "Oh no, that can't be them! "They really didn't look much like their photos. But we'd come all that way so I decided to remain optimistic. When the two girls were pulled out of their paddock, it was obvious that the one mare was not much bigger than a large pony, so I didn't bother to ride her. The other was stout enough, but when I climbed onboard she was very uncomfortable at the lope. In an adjacent pasture was the one gelding I was interested in. He had a sweet face and carried himself like a sound, athletic horse that could really trek down the trails. But when I climbed in the saddle and tried to work him in the arena, he revealed an annoying tendency to fall in on the turns. Badly. Though I reasoned I could fix that with some arena work, there was no denying that this was not destined to be a love affair. I didn't want to spend my bundle of cash on him. I made a respectable offer, which the seller declined. So the trailer went home empty. Once again I'll use the analogy of comparing horse shopping to dating. Today it was like going on a much anticipated blind date that fell far short of expectations. Wally's just going to have to be patient, because I'm not having much luck finding him a stable mate. This is a photo of the horse I tried out today. I dragged my sister along and made her serve as Official Horse Inspector (she notices everything) and as impromptu photographer. As you can see, he's sort of Wally-esque in his markings and conformation, although he's nearly black while Wally is coppery red. This is the best horse I've tried so far: he was very comfortable to ride, moved nicely off my leg and was light in the bridle and neck-reined. Even better? He loves to be petted and fussed with. "He needs someone wh0 wants to be his mom," the seller said. The only reason I didn't plunk down a deposit on this horse is because my husband has volunteered to drive me 200 miles to a ranch on Tuesday to look at several horses there. He even offered to tow the horse trailer along! So you know what that means: He's already resigned himself to the fact that I'm buying a horse on Tuesday... unless I've been entirely misled by the seller. However, if I don't find a horse that I fall in love with, there's always the black and white fellow I rode today. I consider him "Option B." 1.How much basic training has your horse had? (I must always ask this as I'm still perplexed by how many trail horses are ridden western in curb bits when they have never been taught to neck rein or move away from leg pressure). 3. How would you describe your horse's disposition? (In other words, "Where does your horse rate on the Wally Scale of Obnoxious Ground Manners?"). 4. You say your horse goes out on trail. In general, what sort of trails do you ride on? (This is a loaded question, as this line of questioning includes the deal breaker: "Does your horse willingly cross water?"). 5. Would you say that your horse is comfortable to ride? (With my physical problems in my neck and right arm, I can't ride a horse that's like sitting atop a bouncing bucket of rocks). If the seller responds favorably to my questions, then I ask for a video. Unlike one of my readers, I haven't yet gotten a video of runaway horses, but I have gotten a video of a lame horse. As for the horses I'm seeing on Tuesday? I haven't previewed any videos, but I have seen some very appealing snapshots. I realize the long drive is a gamble, but with 4 potential horses to look at in one place, it's worth the trip... I hope. If you'd like to share a thought or comment, just click on "comments" below! Horse shopping is not fun. Many of you seem to agree with me, based on the comments I get from readers. I suppose hunting for another horse would be enjoyable if all the potential horses could be gathered up in one spot so I could peruse them in one day. You know, so that I could hop on the roan gelding first, then climb on the bay filly next, then watch the barely broke pinto have a spin in the round pen. But it's not like that. Instead I make endless phone calls chatting with nameless strangers about their horses. And while I live in a very horsey community, for some reason just about every horse I'm remotely interested in-- based on ads in print or online-- happen to live at least 75 miles away. I can't wait to get my phone bill. Since I'm not into making road trips that I'm fairly confident will end up being wild goose chases (wild horse chases? ), I always ask for additional photos and perhaps a video. I want to see the horse actually doing something, like moving so I can see if it's lame. Or being ridden so that I know that it's broke. I guess it's like online dating. Everyone looks fetching and debonaire in formal attire and all spiffied up, but what's their everyday appearance? Do they play sports or are they couch potatoes? Do they have any outside interests so they get out and about, or are they reclusive homebodies? A video can reveal so much about people and horses: their mannerisms, the way they relate to their environment, how they interact with people. For example, biting the person next to you is not a welcome trait in horses or people. So for these long-distance horses, I'm going to continue to ask for a video. Even a YouTube snippet is fine. And I realize that many times my query will be met with a lengthy pause, followed by a sigh, as if cranking up the video camera is similar to undergoing a root canal. But in today's economy, when horse prices are flat and my gasoline is priceless, asking for a video doesn't seem like a ridiculous request.